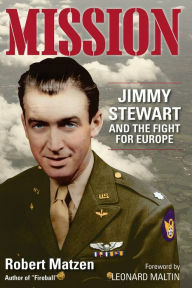 Robert Matzen’s Mission: Jimmy Stewart and the Fight for Europe is a detailed account of the beloved actor's military service in the Army Air Corps during World War II. Stewart was drafted and chose to serve, pitching his developing love of flying to serve his country as part of “The Greatest Generation” of numerous military veterans who sacrificed time and their lives in various war theatres around the world. Stewart is a favorite actor in this household, with It’s a Wonderful Life one of the films that endears us to him. Our appreciation of Stewart and his down-to-earth demeanor led me to want to review this book. Matzen did not disappoint, going into great detail to highlight not just Stewart’s service in the military but bringing attention to several stories on the Allied front as they served under him in England and on several bombing missions over Europe. Sprinkled in were accounts from the German front, specifically highlighting a German Luftwaffe General’s story as the war unfolded. Mission captures Stewart’s guarded, quiet, personality at its core and how World War II changed him and so many other men who fought in it. He was pained by the battles and the loss of men under his watch, bearing those scars for the duration of his life. Mission spends little of its pages devoted to Stewart’s years after World War II but does a great job of capturing the essence of Stewart and how he treated those under his command with the same respect and decency that would have made Mr. Smith proud in Washington.